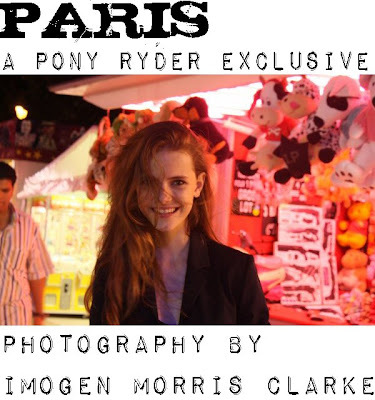 " Paris trough Imogen's Lense"
IMOGEN: I love Paris. When I went there last October for the final fashion week, the dismal weather and my constant yearning for home made it impossible for me to enjoy myself and my surroundings. i saw it not as a culturally diverse and fashion forward capital, but as a stonewashed, slightly prettier and equally rainy version of London! However, every time since then I have grown increasingly fond of this picturesque capital, and the couture week affirmed that I had finally fallen for the romantic yet cosmopolitan allure of the city. Additionally, a few days before coming to Paris, I bought a digital camera. i know nothing about taking pictures, but I had wanted a camera for a while after always being on the other side of the lens! I thought it would be a great chance to record my visits and widen my knowledge. These pictures are a few I took of couture week in Paris; backstage, after shows, and just messing around. I had such a fun time recording my stay and loved that all my friends were happy to pose for my pictures; beautiful people in a quintessentially beautiful city. 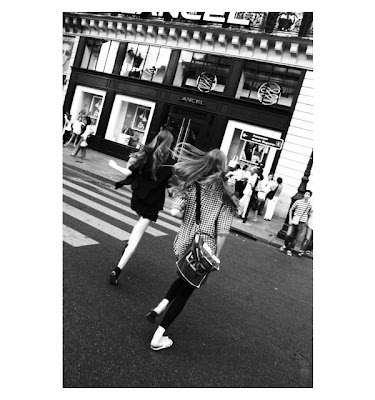 Me, Nimue Smit, and Katie Fogarty outside the Paris Opera. We had an evening off after fittings and castings and decided to meet up and go for dinner and ice cream. I went to that same Haagen Daas later in the week with Hanne and Skye (Stracke)! 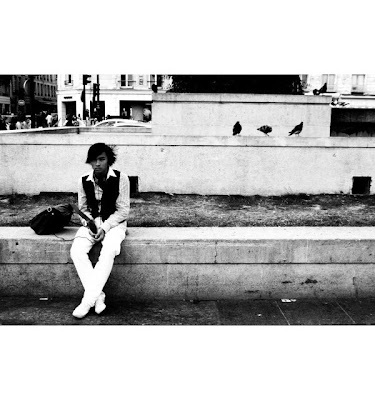 This was just a boy sitting by a fountain in Hotel De Ville. I liked the way his hair contrasted with the pigeons near him, so I took a picture and ran away. Hanne (Gabby Odiele) at the Alexandre et Mathieu show. Backstage at Chanel. The food is to die for!! Possibly the highlight of my week. And I really love pain au raisins. This is Hanne (Gaby Odiele) and Toni (Garrn) eating 'Barbe Papa' (candy floss.) 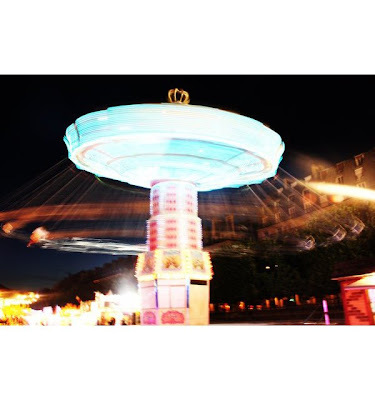 We went to the fair at Tuileries for Toni's birthday and had so much fun. We were running around like little kids, and eventually ran out of money - so we just begged to be let on free and got a bunch of free snacks too! Me and Hanne on the caterpillar ride. Possibly the least scary ride of the whole park, but it was just us on the rollercoaster, so we went really overboard ; screaming and cheering until the poor attendants had to throw us off! PHOTOGRAPHY BY IMOGEN MORRIS CLARKE.